In den nächsten fünfzehn Jahren könnte der Nordosten Englands einen Rückgang der Bruttowertschöpfung (BWS) um 10,5 Prozent erfahren, wenn Großbritannien in eine No Deal Brexit-Situation gerät. Nach den Prognosen der Confederation of British Industry (CBI) wird die Region am stärksten betroffen sein, wobei die West Midlands und Yorkshire and the Humber mit “fast 10 Prozent” an zweiter Stelle stehen. Für Nordirland, das stark vom Handel mit der EU abhängig ist (74 Prozent aller Exporte), wird ein Rückgang um 9,1 Prozent prognostiziert. London dürfte am wenigsten betroffen sein, würde aber laut Analyse dennoch einen Rückgang von 6 Prozent erleiden. 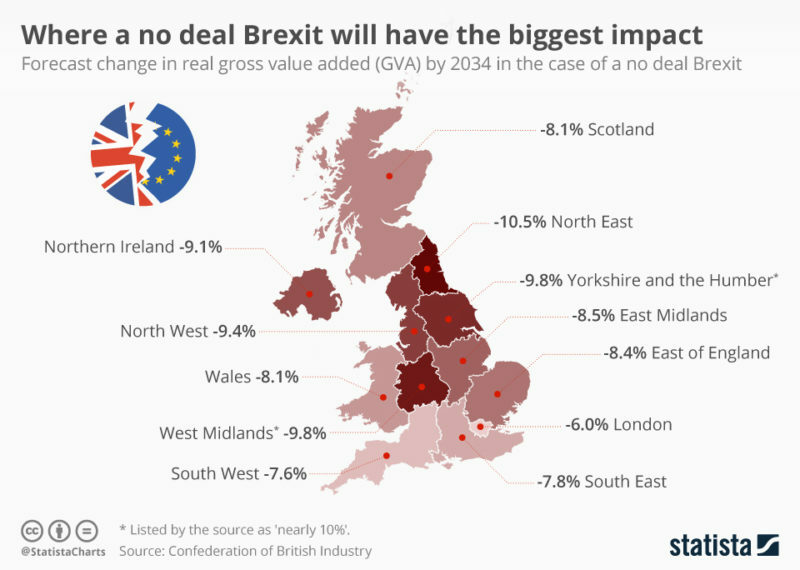 Over the next fifteen years, the North East of England could experience a fall of 10.5 percent in gross value added (GVA) to the economy if the UK ends up in a no deal Brexit situation. According to Confederation of British Industry (CBI) forecasts, the region will be the worst affected, with the West Midlands and Yorkshire and the Humber in joint second with “nearly 10 percent”. Northern Ireland, which is heavily reliant on trade with the EU (74 percent of all exports), is forecast to see a 9.1 percent drop. London is expected to be the least affected, but would nevertheless suffer a 6 percent decrease according to the analysis.